an illustrated account of the formation and activities of the Australian & New Zealand Masonic Research Council (ANZMRC). Walter F Meier Lodge of Research #281 (GL Washington, USA). Paper first delivered in June 2007 to the Walter F Meier Lodge of Research #281 in Seattle (WA, USA) and published in the 2007 Transactions of that Lodge. The Australian and New Zealand Masonic Research Council (ANZMRC) is a voluntary association of research lodges from the seven local Masonic jurisdictions, which enables these lodges to cooperate in many ways to their mutual advantage. It crosses jurisdictional boundaries without interfering with the authority of the various Grand Lodges, and has begun to bring Australian and New Zealand research to the attention of the rest of the Masonic world. This paper provides a brief history of ANZMRC and an outline of its achievements. Australia is an island continent, approximately the size of the 48 contiguous states of the United States of America, but with a much smaller population, most of which is located on the eastern, southern, and south-western coastlines, and the island of Tasmania. Politically, it comprises six states (Queensland, New South Wales, Victoria, South Australia, Western Australia, and Tasmania) and two mainland territories (the Northern Territory and the Australian Capital Territory), all of which have a measure of self-government under the federal Commonwealth of Australia, plus several offshore territories under direct federal rule. New Zealand is located southeast of Australia, comprises two main islands, and is a separate political entity. Both countries are part of the voluntary association known as the British Commonwealth of Nations—as, indeed, is Canada. The regiments of the British army brought Freemasonry to Australia, as they had previously to the British colonies in North America, and thus Irish, English and Scottish lodges were established in each of the Australian colonies, and spread to the colony of New Zealand. Eventually, local Grand Lodges were established, one per colony. Such establishment was not always achieved harmoniously—where the word ‘united’ forms part of the title, it indicates a prior period of dis-unity—and some compromises were necessary. The United Grand Lodge of Queensland (1921) has a number of lodges which are permitted to retain their Scottish ritual and regalia in return for their affiliation to the local Grand Lodge. This Grand Lodge also has lodges in the independent country of Papua New Guinea, north of Australia, and there are two lodges under the United Grand Lodge of England in rural Queensland (plus one English lodge in Papua New Guinea). 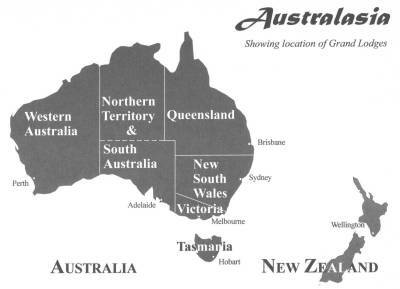 Two whole Districts of lodges under the Grand Lodge of Scotland, and one solitary English lodge, survive in the territory of the Grand Lodge of Western Australia (1900), and one English lodge is still at work within the territory of the United Grand Lodge of Victoria (1889). The Grand Lodge of South Australia and the Northern Territory (1884) permits several of its own lodges to work foreign rituals (German, Italian, English and Scottish) in various languages, and has one lodge under the Grand Lodge of Ireland in its territory. The United Grand Lodge of New South Wales and the Australian Capital Territory (1888), and the Grand Lodge of Tasmania (1890) have no recognized foreign lodges. 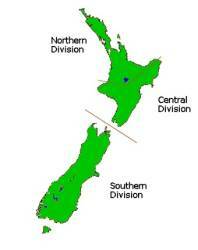 The Grand Lodge of New Zealand (1890) shares territory amicably with a large number of English lodges (two Districts), Scottish (two Districts) and Irish (one Province). New Zealand also has lodges in Western Samoa and American Samoa. Each Grand Lodge permits—and some actually encourage—Masonic research. This takes various forms. New Zealand has ten chartered research lodges, and only Past Masters may become full members; Western Australia has only one chartered research lodge, which has a research monopoly for the whole jurisdiction. Geographically huge South Australia & Northern Territory, and tiny Tasmania each have two chartered research lodges, one in the north and one in the south. New South Wales & Australian Capital Territory, and Queensland each have one chartered lodge of research, one or more ‘lodges of instruction’ which turn their attention to research, and informal study groups. Recently New South Wales has also chartered other lodges which have a research interest and strong Internet links. Victoria has two lodges of research and at least two informal groups. The earliest Australian research lodges were established between 1889 and 1921, and there was a surge of renewed interest some years after World War II, but there was very little inter-jurisdictional contact between these lodges. Most research lodges published their papers only in pamphlet form, or on loose sheets, and some did not publish at all. Circulation was generally limited to their own members, and sporadically copies were supplied to other research lodges. There was little personal contact outside the jurisdiction, and virtually none beyond the shores of Australia. But in 1990 this was about to change. The architect of change was Kent William Henderson, of Victoria, known at least by name to most Australian researchers by virtue of his books, ‘Masonic World Guide’ (Lewis Masonic, London 1984, distributed in USA by Macoy), and ‘The Masonic Grand Masters of Australia’ (Drakeford, Melbourne 1988). The catalyst was a paper on the history of Masonic research in Australia and New Zealand, by a hitherto unknown South Australian researcher. Both were about to become Master of their respective lodges of research and, on Henderson’s initiative, each presented a paper in the other’s lodge. Henderson contacted researchers in other jurisdictions and outlined his ideas for a joint venture to form an Australian Masonic Research Council. His contacts obtained agreement in principle from their respective research lodges, and formed an interim committee: one member from each of the six Australian jurisdictions, with Henderson as interim secretary. In typical Henderson fashion, he immediately presented the committee with a draft constitution and set of aims for the proposed Council, and eventually secured their agreement. * To publish the tour lectures, conference proceedings and other books. It was agreed well in advance that the inaugural meeting would be held in Melbourne, Victoria, in mid-June 1992, under the auspices of the Victorian Lodge of Research. But other events were already in hand—Henderson’s hand. 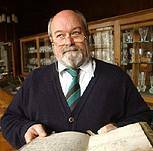 In 1990, while the interim committee was still in the process of being formed, Kent Henderson, as future Master of the Victorian Lodge of Research, arranged for well-known English researcher John Hamill to visit Australia and address the Victorian Lodge of Research. Henderson then offered Hamill to the other research lodges, upon payment of a share of the costs. The offer was eagerly accepted, and the Hamill lecture tour was scheduled for June 1991. However, shortly before Henderson was to be installed as Master of the lodge, he learned that another famous English researcher, the Revd Neville Barker Cryer, was planning to visit relatives in Australia, en route to New Zealand for the centenary celebrations of the Grand Lodge of New Zealand. Henderson quickly arranged an imprompu lecture tour for Cryer, before the Hamill tour. He also arranged for a book of Hamill’s lectures to be published after his tour, the cost being underwritten by the Victorian Lodge of Research. Time was too short for him to arrange for a book of Cryer’s lectures. * June 1992, inauguration of the Australian Masonic Research Council. The first Conference of Australian research lodges, at which the Australian Masonic Research Council was inaugurated, was a three-day affair, which set the pattern for future conferences. The lodges had been requested to supply a speaker (one per jurisdiction) to present a research paper worthy of the occasion. Each paper was allotted 90 minutes for presentation and discussion. The first of these was presented on the Friday evening, in a tyled lodge, and was followed by a full Festive Board (a formal dinner, with a toast list). * Publish ‘Proceedings’ of Conferences, and books of the tour lectures. Two categories of membership were established: Affiliate (full) membership would be open to all Australian (Craft) research lodges and less formally organized research groups, and each affiliated body would have an equal vote; Associate (non-voting) membership would be open to other lodges and bodies associated with Freemasonry, in Australia or overseas, which met with the approval of the Council. The affiliate members of a particular jurisdiction nominated a Council representative from their jurisdiction to a (standing) executive committee, with authority to consult and power to act on behalf of the Council between the biennial meetings. The officers of the Council were elected from this committee at the general meeting. The Victorian representative, Kent Henderson, was elected Secretary of the Council, an office he has continued to hold to the present date. The Council decided to retain the format of the research papers presented at the inaugural conference, and to name them Kellerman Lectures, in honor of Harry Kellerman, OBE, Past Deputy Grand Master of New South Wales and the Australian Capital Territory. Maurice Herman (Harry) Kellerman (1902–2000) was a teacher for all of his adult life: in the public school classroom, by correspondence, by radio, in the Jewish community, and in Freemasonry. He was a founder of the Research Lodge of New South Wales (1968) and its editor for over 30 years. He was appointed Grand Librarian in 1982, and compiled a significant section of his Grand Lodge’s history. Among Masonic researchers he encouraged reference to primary sources and precise citation, and vigorously discouraged slipshod presentation. 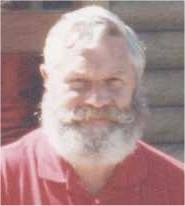 Kellerman gave an exemplary paper at the 1992 conference, at the age of 90, and attended two subsequent conferences, in Sydney, New South Wales (1994) and Perth, Western Australia (1996), but was not well enough to travel to Tasmania in 1998, and, sadly, he took his final degree in his 98th year, just a few months before the fifth biennial conference held in Brisbane, Queensland (2000). The theory behind the form and requirements of a Kellerman Lecture is an analogy with formal schooling: if a Craft lodge may be considered primary schooling, then a research lodge ought to be at the secondary level, and the Council’s conferences should provide the setting for tertiary (University) level. To this end, a Kellerman Lecture is required to contain the author’s original work, previously unpublished, and be of interest beyond the boundary of his own Masonic jurisdiction. The author must present his paper in person, and be prepared to defend his thesis. It is up to the author to decide how much of the allotted 90 minutes should be devoted to presentation, and how much is left for questions and discussion. The author may include as much additional material as he wishes in the printed version of his paper, and then speak to the paper rather than read it all. The papers are published in the Conference Proceedings, which are given to registrants at the beginning of the three-day conference, allowing them some time to assess what is to be presented. Clearly, it is better to allot a non-controversial paper for the first session, although organizers seldom seem to take this into account. Some papers fall short of the standard hoped for, but many fulfil the aims of the founders, and some are of world standard of excellence. It is up to the affiliates of a particular jurisdiction to determine selection criteria for their candidates’ papers. When all offerings fall short of these criteria, the choice is between lowering the standard or declining to offer a Kellerman Lecture on that occasion. To date, there have been only two occasions when the Council itself was obliged to reject the jurisdiction’s offering. Similarly, if there is a shortage of suitable lecturers in a jurisdiction, the choice lies between recycling a Past Kellerman Lecturer and not filling the vacancy. Recycling, I would suggest, is contrary to the original design, which was to provide an opportunity for as many researchers as possible to experience the presentation of a paper for judgment by their peers in other jurisdictions; in other words, to give the small frog a bigger pond in which to grow. Now, when such a vacancy occurs, the committee has authority to offer it to another jurisdiction, to fill the conference program. Generally, the Grand Lodges from which the Council draws its affiliate membership have been supportive of the Council’s aims and activities, recognizing that these activities aid research and education within the jurisdictions and that the Council’s growing reputation overseas reflects favorably on the Grand Lodges concerned. However, the Grand Lodges reacted adversely to the manner in which the Council proposed to recognize the status of Kellerman Lecturers. The Council wished to award a special collarette jewel to Kellerman Lecturers; the enameled jewel, containing the Council’s logo and the words Kellerman Lecturer on the front, with the name of the recipient and date of award on the back, would be worn around the neck on a pale blue ribbon on all Masonic occasions. This would be similar to the collarette jewels worn by Prestonian Lecturers in the Craft and Batham Lecturers in the Royal Arch in England. The Grand Lodges refused to permit this, insisting that it was the prerogative of Grand Lodge to award collarette jewels. The Council was obliged to accept that ruling and decided, instead, to create a pocket jewel, only to discover that regulations in some jurisdictions forbid the wearing of other than prescribed pocket jewels. So the Council was obliged simply to issue a certificate and a badge to the Kellerman Lecturers, the badge to be worn where and when permitted by the recipient’s Grand Lodge. In at least one jurisdiction even the badge may not be worn on a tyled Masonic occasion. The badge, in the design of the proposed jewel, is individually created for each recipient by committee member and current Treasurer Andy Walker. The Council began with eleven affiliates: four in Queensland, two each in Victoria and Tasmania, and one from each of the other states. Shortly afterwards, two more research bodies under the jurisdiction of the United Grand Lodge of New South Wales joined as affiliates, and the Council welcomed its first associate members, a Rose Croix (Scottish Rite) Chapter in Victoria, and an English lodge of research in Johannesburg, South Africa. Favorable publicity was generated by the biennial conference in Sydney in 1994, and the lecture tours of Cyril Batham in 1993 and Neville Barker Cryer (back again, this time officially) in 1995. Another associate was added, a Royal Arch research chapter from Victoria, and interest was expressed by several of the research lodges in New Zealand. At the 1996 conference, held in Perth, Western Australia, the Constitution was changed to permit New Zealand research lodges to join as full members (affiliates) and consequently to change the name to the Australian & New Zealand Masonic Research Council. The result was four new affiliates and one associate member—50% of the research lodges in New Zealand. At the conference, the Council voted unanimously to admit a Prince Hall research group, the Phylaxis Society, to associate membership and then, at the request of the newest associate, presented a Phylaxis Society award to an Australian researcher. The conference also decided to produce a quarterly newsletter, which commenced in January 1997. Over the next ten years, research groups worldwide joined as associates. They now include: a Masonic Study circle in Mumbai, India; the prestigious Lodge of Research CC in Dublin, Ireland; an Irish Masters lodge in Jamaica, West Indies; a Lodge of Instruction in Nairobi, Kenya; an English research lodge in Johannesburg, South Africa (the first overseas associate); a Scottish research lodge in Singapore; the Alpina Research Group in Switzerland; and the Phylaxis Society in the USA; as well as one New Zealand research lodge and two lodges and a study circle in New South Wales. Several factors combined to attract the overseas associates, including: encounters with much traveled committee members Webmaster Richard Num, Secretary Kent Henderson, and long-term President Murray Yaxley; the surprisingly widespread circulation of the quarterly newsletter, ‘Harashim’; and publicity arising from the lecture tours and the associated books. There are now 22 affiliate (full) members: nine from New Zealand, four from Queensland, one from Western Australia, and two each from the other Australian jurisdictions. The 100% membership of New Zealand research lodges is largely due to the recruiting efforts of Assistant Secretary Colin Heyward and the interest generated by the seventh biennial conference, which was held in 2004 in New Zealand. At the 2006 conference, held in Ballarat, Victoria, the Constitution was amended again to acknowledge the increased membership of New Zealand lodges. From 2006, there are two NZ committee members, and every fourth conference will be held in New Zealand. Similarly, from 2008 New Zealand will be invited to provide two Kellerman Lectures at each conference. the Australian and New Zealand Masonic Research Council. by W.Bro. Tony Pope, Editor of the ANZMRC’s publications. With few exceptions, the lecture tours have been a great success. A tour of the Australian and New Zealand lodges, with 18–22 venues, requires about six weeks to complete the mentally and physically demanding program without undue stress. If the lecturer can spare more than six weeks and is willing to travel further, the Council organizes additional venues in Africa and Asia. On one occasion the Council routed a lecturer via North America, where he made a short tour of American and Canadian jurisdictions while on his way home to Scotland, and on another occasion the Council allowed a lecturer to detour, at his own expense, to Japan. There is no shortage of first class lecturers, but a few of the candidates have been obliged to decline the invitation for reasons of health or simply not being able to spare so much time. The Council organizes the trip and pays the fares, then bills the participating lodges for an equal share of the cost. It is the responsibility of the host lodges to provide meals, accommodation and local travel and entertainment. Usually, the lodges recoup their outlay by charging a fee for attendance at the lectures, and expenses are often minimized by accommodating the lecturer in private homes. Masons are notorious for NOT buying books about Freemasonry, with the consequence that most Masonic books are printed in small numbers, which increases the unit cost, and that reduces the potential market even further. The Council has learned that the local market will bear from 500 to 700 copies of a good book, perhaps once a year. Aiming to corner half of that market, the Council has successfully published the collected papers of the tour lectures in soft cover, using the participating tour lodges as retailers. Experience indicates that the majority of books are sold as autographed copies on the night of the lecture. The Council sells a few copies overseas by mail order, but postal charges substantially increase the cost of the book. Consequently, on some occasions the Council has cooperated with an overseas publisher in the production of a separate overseas edition. If we include John Hamill, whose tour and book preceded the official formation of the Council, to date there have been seven touring lecturers and their books, with the eighth scheduled for October 2007. A quick count on fingers and toes will indicate that something is missing. The explanation is simple: we got out of sequence in 1999/2000, and a further mishap brought us back in sequence in 2003. Detail is provided in the following notes on the lecture tours and associated books. No manuscripts were supplied; the material for the book was obtained from audio tape recordings made at the lectures, and the book was published some months later. We learned from this. Hamill was a hard act to follow and Batham, although a top Masonic scholar, lacked charisma in presentation; add to this some serious defects in the book, and sales were not good. Again, we learned. A popular speaker, heartily welcomed back to our shores; the book was a trifle slender, but well produced, and sold well. Many years later, ANZMRC was happy to provide the edited text to Lewis Masonic for a revised edition to be published in the UK as ‘Did you know this, too?’, a sequel to his ‘I just didn’t know that’. This brilliant scholar and speaker from Canada consolidated ANZMRC’s growing reputation. Recently, Anchor Communications (Virginia, USA) has published a revised edition of this book. Another star in the firmament of Masonic research, Yasha is a gifted and professional after-dinner speaker. He was not available for 1999, and the Council experimented with the idea of combining the tour and the biennial conference in 2000. Yasha attended, and contributed to the conference; the conference, the tour and the book were all highly successful, but we experienced administrative problems in combining events. The book cover was a delightful montage of collectables mentioned in the text, and the numerous interior illustrations were fine. We did a bigger than usual print run and Yasha placed a bulk order, to sell the book from his shop in the UK. This young Prince Hall researcher from Ohio was originally scheduled to tour in 2002, but there was a serious illness in the family, and the tour was postponed to 2003, thus bringing us back into the tried and true sequence of tour and conference in alternate years. The first half of his tour, through New Zealand and the east coast of Australia, was highly successful, but the tour was abandoned when one of his children was injured in a road accident and he flew home. Prior to the tour, arrangements were made with Anchor Communications for a North American edition to be published at the same time as the ANZMRC book. A few months later, friends and fans were stunned to learn that David Gray had been arrested on dishonesty charges and subsequently jailed for nine years. I’m not sure what lessons we learned from this tour. Bob Cooper, hailing from Edinburgh, did not require an interpreter for the tour, which included South Africa and India, and was followed by a self-organized mini-tour in North America. He charmed audiences wherever he went, and the book was brilliant, except for a problem with the interior illustrations. Indications are that the book and tour will maintain the high standard established by the Council. An English edition of the book is being arranged. 2002—Murray Yaxley (long-term chairman of the fraternal relations advisory committee of the seven Grand Lodges of Australasia, and three times President of ANZMRC); Kent Henderson (Secretary of the Council from its inception, responsible for organizing lecture tours, conferences, publications and everything else); and Tony Pope (editor of the Council’s publications). 2004—Graham Stead (long-time Treasurer and one-term President of the Council); Andy Walker (long-time behind the scenes worker and unglamorous office-holder); and Max Webberley (philosopher, guide and quiet achiever). 2006—Colin Heyward (Assistant Secretary, New Zealand representative and recruiter); and Richard Num (long-time Webmaster, one-term President, and enthusiastic overseas recruiter). The creation of the Council called for vision and forward thinking, and these requirements were provided in good measure by Kent Henderson and his carefully selected supporters. The original goals have been met, and a workable system is in place. But experience suggests that organizations, like people, must continue to grow or face stagnation and eventually deterioration. The good news is that there are still live issues and challenges ahead. The first of these is to provide replacements of long-term key personnel. The offices of president and treasurer are obviously important, but competent replacements can usually be found. The key office is that of secretary, more so in the Council than in most other organizations, because he arranges the lecture tours, the conferences, the Kellerman Lectures, and the printing and distribution of the various publications, in addition to routine secretarial duties. It calls for a wide range of contacts and skills, and almost limitless time and energy. This has been recognized by the Council in its appointment of an assistant secretary. To a lesser extent a similar need arises with regard to the editor of ANZMRC publications, and the appointment of an assistant editor would provide a transitional period. With the increase of Kellerman Lectures from six to seven in 1998, and to eight in 2008, the duration of a biennial conference may have to be extended. The practice has been to commence on a Friday evening and conclude on a Sunday afternoon. It may be necessary to select a weekend when the following Monday is a public holiday in all or most of the jurisdictions represented. This would also permit the introduction of a workshop or general discussion period. At present the opportunities for networking and informal discussion are limited to late evenings and times before and after the conference. There is also a question of who may attend a conference. Traditionally, attendees are either members of the Affiliates and Associates, or members of the host jurisdiction. Most sessions are not tyled, and on some occasions non-Masons and members of unrecognized jurisdictions have attended such sessions, but this has not met with approval from some delegates. The issue needs to be resolved. Over the past seven years the wish has been expressed to try using local lecturers for some of the tours, for example to have an Australian tour New Zealand and a New Zealander tour Australia. The wish may be granted in 2009, as British and American prospects have declined. Two related projects initiated in New Zealand have great potential. The first is to compile a catalog, online and on CD or DVD, of all research papers published in Australia and New Zealand by ANZMRC and its affiliates and associates. This is in the hands of the originator, Ed Robinson, and Assistant Secretary Colin Heyward, but will require the active cooperation of the research lodges. The catalog will be searchable by title, author, publisher, date, topic and keywords, which will inform the searcher of the identity and whereabouts of the paper. He will then be able to contact the source for a copy. The second project arises from the first, and that is to make copies of the papers available online via the Greenstone Library software, either as read-only files or downloadable (whether free or on payment of a fee). The library papers will be limited to those which the lodges and ANZMRC are prepared to supply for this purpose. A spin-off from these projects is the option of placing the transactions of one or more research lodge/s on CD for sale by the lodges. Legal and financial aspects, as well as approval and assistance by authors and publishers, still have to be resolved, but the projects have been started. Just before the turn of the century, when Yasha Beresiner was Master of Quatuor Coronati Lodge in England and Paul Bessel was Master of the Civil War Lodge of Research in Virginia, the two lodges exchanged visits. 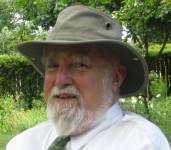 Paul Bessel was well aware of the activities of ANZMRC and attempted to initiate formation of a similar organization of American lodges of research, but sheer numbers, and the reluctance of American Grand Lodges to form inter-jurisdictional associations other than at Grand Master level, doomed the attempt to failure. Perhaps an attempt on a regional basis, as has been tried in this jurisdiction [Washington state] with Canadian and Oregon research lodges, might be more successful, provided the groundwork is carefully prepared. ANZMRC has two associate members in Africa, one in Johannesburg and one in Nairobi. There are a number of research lodges in South Africa, in four jurisdictions, and these might well benefit from an organization similar to ANZMRC, and if successful could look to expand as far north as Kenya, where there are several Lodges of Instruction that engage in research and are always looking for visiting speakers. It is possible that an African Masonic Research Council and ANZMRC might eventually exchange touring lecturers. There are numerous research lodges in India and Southeast Asia, and ANZMRC has associates in both areas. Here is another region for potential cloning. Who knows, one day there might be a World Association of Regional Masonic Research Councils. If so, the headquarters would probably be in the northern hemisphere, in Europe or here in North America. ANZMRC is not yet so old that it has begun to fossilize. It has achieved much in 15 years, with the establishment of conferences, Kellerman Lectures, lecture tours, and various publications. It has learned by trial and error, and still has much to learn. It has almost reached its limit of expansion of membership in Australia and New Zealand, but still has problems to solve, arising from the fact that it covers seven Masonic jurisdictions and two politico-legal systems, and still has room for improvement and expansion of services. Apart from refining the operation of current activities, the Council is willing to expand its interests within its own geographical region, and is prepared to provide assistance elsewhere upon request. The future of ANZMRC looks bright. For more information, see volume two of Henderson & Pope’s ‘Freemasonry Universal’, Global Masonic Publications, 2000. Incomplete and somewhat outdated, but still useful on the subject, is ‘Australasian lodges of research: an historical overview’ in ‘Masonic Challenges’, the 1991 transactions of the Victorian Lodge of Research, Melbourne 1992, and reprinted in volume one of ‘Masonic Research in South Australia’ (1994), which is included in the ‘Downunder Research’ CD, copies of which are in the Walter F Meier Lodge library and the Grand Lodge library at Tacoma. The complete collection of Kellerman Lectures from 1992 to 2004 will be available on CD some time in 2008. Meanwhile, a selection is included in the ‘Downunder Research’ CD. The first 40 issues of the newsletter, ‘Harashim’, are included in the ‘Downunder Research’ CD. The Paper Masonic Research in Australia and New Zealand, by W.Bro. Tony Pope talks about a project that was in development in 2007 when the paper was written. The first edition of the “Masonic Digital Library”, sponsored by the ANZMRC was issued in March 2008, and a further edition is planned for release during 2009. Many readers of Pietre–Stones Review of Freemasonry are also members of a ‘masonic research organisation’. They know that the publications of ‘research lodges’ cover the whole range of Freemasonry, and that within that huge range of material are some real gems – information to cover most general enquiries, talks that have inspired, discussions that have clarified uncertainty, and topical lectures that illustrate matters of concern to freemasons through the last century. The problem is that these are inaccessible – often even to members of each organisation. The Digital Library gathers a file for each ‘paper’ or item of Masonic interest, collects these in electronic form, and allows the generation of lists by author, title, subject – or searches by any word or phrase. With many research lodges coming up to their centenary, the Masonic Digital Library offers a way to make past papers accessible to members – as well as sharing these with members of other research organisations, and giving your members access to papers from other research lodges. The collection (currently over 2,100 files and growing) will only be accessible by members of participating research organisations – similar to sharing copies of transactions. The plus is that it is free to those who qualify for access. This desirable reference collection can only get better as more publishers participate. If you are a member of a Masonic research lodge or association, make sure someone contacts the Secretary of the ANZMRC to discuss participation.